Install this tool to enable the ability to grant temporary permissions (roles and group membership) to users in your ServiceNow instance. As an Admin, simply click the UI Action on a user's profile, and fill out the required fields on the dialog window that pops up. 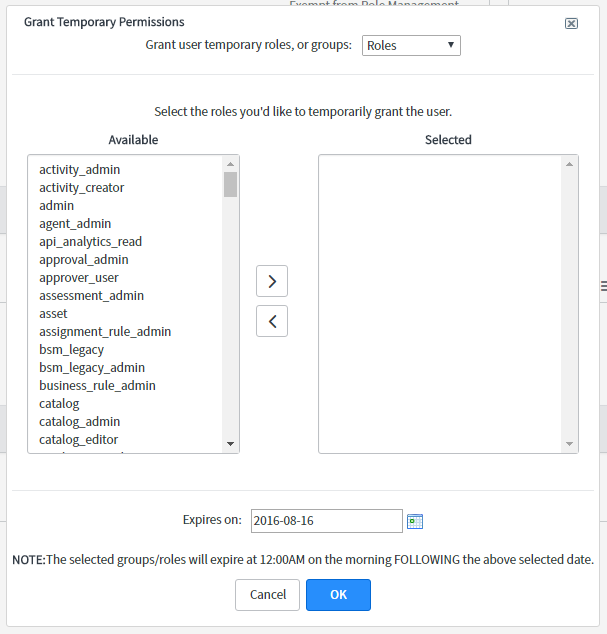 This will allow you to add a user to a specified list of roles or groups. Alternatively, you may wish to bulk-add users to a single group. To accomplish this, navigate to the group record and then click Add Temporary Group Members. You'll then be prompted to paste in a comma-separated list of user IDs corresponding to users who should be bulk-added to the group. Note that the expiration date is the last day on which they'll be able to use their permissions (inclusive). The default value is today. So if you do not adjust this value, the permissions will be revoked by the next morning. Permission revocation for expired temporary roles happens at midnight.